As expected, the drastic reduction of sixty to three months of visas to visit the United States has affected tens of thousands of Cubans who travel to the United States as non-migrants. 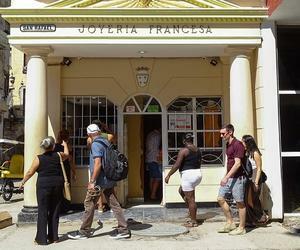 Although this decline is due to a "reciprocity" with the treatment given by Cuba to the Americans, since the Caribbean nation grants US tourists one-entry visas for a two-month stay, which can be extended for another 30 days for a total of three months, from next March 18 not only will be reduced by 20 times the time that may be Cubans in the country of the North, but it is virtually nullified contact between them and their families. In the words of taxi driver Osvaldo, 35, the worst thing about this step back in the relations between Cuba and the United States is that the big hit is always on this side of the pond, and it is the Cuban people. The five-year visa at least offered a bit of inner peace in the souls of those who knew we could have an extended permit to go see our people. "Now the usual anxiety will return. This rope had to be split long ago by one of the two sides, and as the most economically and emotionally affected is the Cuban, it was because of him. What happens is that those who govern here do not need the visas that we need to go outside, "says the private worker. In line with what a Cubadebate member comments, the argument that the US government to take this measure is "completely logical, since" it is in its sovereign right "and" I do not have to criticize its decisions ", but "Respect so that they respect me". "I have been investigating and Cuba has a very restrictive immigration policy compared to other countries in Latin America and the world. In the end, if tourists come and generate so many resources, some policies should be made more flexible ", he concludes. Another user of that official page states that "now it's up to our government to extend the visa of US citizens for 60 months allowing several entries, and now!". In the same way, explains the private tenant Juan Miguel, who has passed the ball to Cuba. "Now the ball is on this side of the court and it is up to us to decide, I think that, in theory, as the United States tries to be reciprocal with us, if the Island granted visas for longer times to the Americans, they would do the same. This is a political game in which we will always be caught in the middle. " "Now we are not on equal terms, the most uncomfortable part of the process continues to touch us, although this further distances Cuban families from the difficult process and the cost of visa and air travel, each country dictates their immigration rules and period, visas for Europe are also given for three months, but in Cuba we have been accustomed to the five-year American visa, thanks to which many people subsist, "he added. He himself depends on a visa to see his two children. "There are those who escape because they have another citizenship or residence, but it is not my case, we should have the same possibilities as other countries," says who has traveled more than a dozen times to Miami and another couple to New York. According to Antonio, who just this week received a renewed visa for five years to enter the United States, this will end up killing Cubans in need because it will harshly affect the supply of a clandestine market that supplies the population. "Thousands of us solve our problems there, it is true that between Cuba and the United States there is never a final point, everything comes and goes, unfortunately," he said. "However, if there were a real bilateral interest to improve relations between both countries, the reality would be very different: Cuba has not shown many signs of wanting to relax its immigration policy because neither the price of passports and their extensions has decreased, nor It has extended the visa of the Americans to one year, nor has it allowed the creation of mixed companies of North Americans and Cubans living abroad, "he says. "If it is due to questions of reciprocity, we must ask ourselves what we can do to reach a consensus, not to put ourselves to the test." It is not a secret that the Cuban emigrants are crying out for the issue of entry to Cuba, which is extremely expensive. You have to pass the problem to the US government, "adds the cuentapropista. Since April 1, 2018, the United States processes immigrant visas for Cubans through its Embassy in Guyana, while non-migrant visas can be requested at any consulate other than Havana. Hence, having to apply for a visa in third countries has increased the expense and complications of Cubans to perform this type of procedures. For the first time in the last 22, in 2018, the migratory agreement signed between the United States and Cuba in 1996 was not fulfilled, which guarantees the granting of 20,000 annual visas to Cubans to prevent illegal immigration from the island.